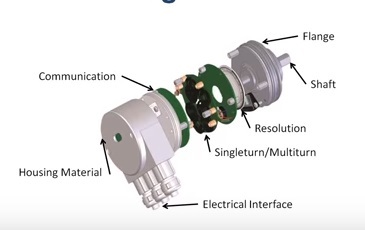 A magnetic encoder consists of a rotating gear made of ferrous metal and a magnetic pick-up that contains a permanent magnet and the sensing element. The gear, which is mounted on the rotating shaft, has precisely machined teeth that provide the code pattern. As the disk rotates, these teeth disturb the magnetic flux emitted by the permanent magnet, causing the flux field to expand and collapse. These changes in the field are sensed by the sensing element, which generates a corresponding digital or pulse signal output. Hall effect — pick-ups use a semi conducting sensing element that relies on the Hall effect to generate a pulse for every gear tooth that passes the pickup. Variable reluctance — pick-ups use a simple coil of wire in the magnetic field. As the gear teeth pass by the pick-up and disturb the flux, they cause a change in the reluctance of the gear/magnet system. This induces a voltage pulse in the sensing coil that is proportional to the rate flux change. High latency time.Not good for high speed application.